We've all had a moment like this: someone you don't know, someone you've never even met, leaves our world for another. And even though you've never met that person, you feel like our world's lost something beautiful. Justin Van Hoy was an artist living in California. He beat leukemia not once but twice, only to die last night due to a freak accident at dinner. I didn't know Justin, but I've known of him for years. One of his oldest childhood friends is now one of my closest friends, and through her I grew to care about him. Because...when someone inspires the love my friend clearly felt for him? That's impressive. She visited Justin and his wife in LA throughout his illness, and his wellness. She campaigned for marrow donations, hoping to help save his life, and the lives of others. Together, they all fought bravely, and they won. When he was well, I quietly celebrated, and drank a toast in his honor. And today, when my friend heard of his death, I mourned with her. I wasn't going to blog this. This isn't my story to blog. But then I realized, there's one thing I can do: I can tell you about Justin's book. 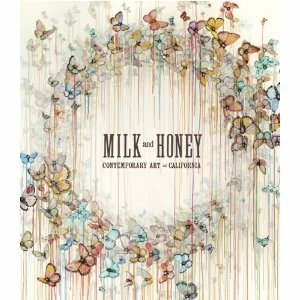 Milk and Honey: Contemporary Art in California was his. Perhaps it's his legacy. No matter what, it's beautiful. Please consider buying Justin's book. You'll gain something so gorgeous and tangible, and you'll support Justin's wife and family as they begin to pick up the pieces left in the wake of losing something so gorgeous and intangible.